"Behold, this Child is destined for the fall and for the rise of many in Israel" (Gospel). 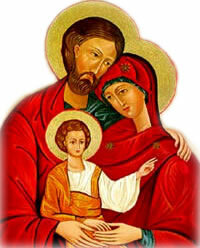 This prophecy that Jesus is also "a sign that shall be contradicted," indicates what we, too, may expect as "sons of God"; yet it strengthens our hope, if we but place ourselves daily under Mary's care; then the last words of the Gospel may also be applied to us: "the Child grew and became strong. . .full of wisdom." Yes, we are the "sons" and heirs" of God, Whom we can call "Father," because of "His Son, born of a woman," Mary (Epistle). Hence, Jesus, our Brother, actually "leapt down from heaven. . .with beauty. . .with strength" (Introit), to "direct our actions" in His "Name"(Prayer). In the Gradual we offer our "good word" of gratitude for the final victory. Then we will realize that Antichrists "who sought the Child's life are dead" (Communion Verse).